우리나라에서 손꼽힐 정도로 큰 석등으로 가운데받침돌을 제외한 각 부분 모두 신라시대 석등의 기본형태인 8각을 이루고 있다. 석등의 전체 높이는 5.18m이다. 석등은 불을 밝혀두는 화사석(火舍石)을 중심으로 아래에는 3단의 받침을 두고 위로는 지붕돌을 올리고 있다. 아래받침돌에는 옆면에 안상(眼象)을 새기고, 윗면에는 커다란 꽃장식을 두었으며 그 위에는 구름을 조각하였다. 가운데기둥은 장고 모양이며, 연꽃을 새긴 마디가 있다. 윗받침돌에도 연꽃이 새겨져 있으며, 그 위에 있는 화사석(火舍石)에는 각 면마다 창을 내었다. 지붕돌의 경사는 급한 편이며, 여덟 곳의 귀퉁이 마다 큼직한 꽃장식이 달려 있다. 꼭대기에는 머리장식으로 노반(露盤:머리장식받침)과 복발(覆鉢:엎어놓은 그릇 모양의 장식)이 놓여 있다. 이 석등은 통일신라시대에 만들어진 것으로 여겨지며, 여덟 면에 모두 창을 낸 예를 남원 실상사 석등(보물 제35호)이나 담양 개선사지 석등(보물 제111호)에서도 볼 수 있어 호남지방 석등의 특색을 보여 주고 있다. 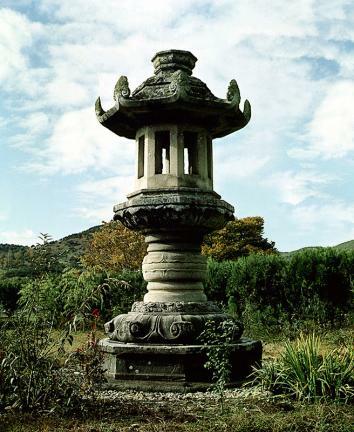 This 5.18m-tall stone lantern sits on an octagonal platform except the middle pedestal. 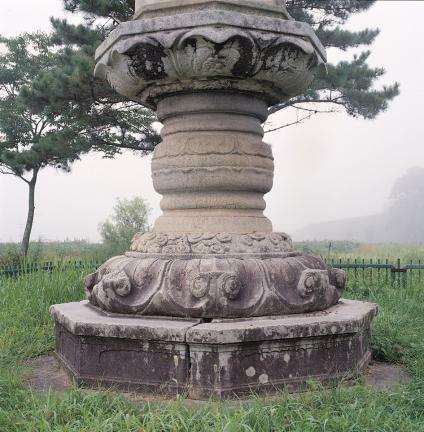 Lotus pattern is carved on the lower part of the pedestal and big floral designs are decorated on the edges. The light chamber has eight windows. The octagonal roof stone is curved sharply upward at the corners and there are big floral decorations at the corners. Noban, the base of the finial, and the hemispheric bokbal (over-turned bowl) are all that remain of the lantern's crowning finial. 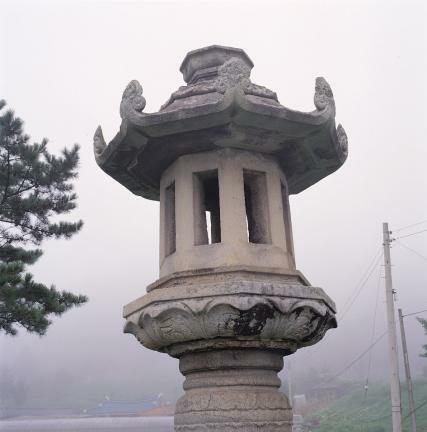 This stone lantern is believed to date back to the Unified Silla period. 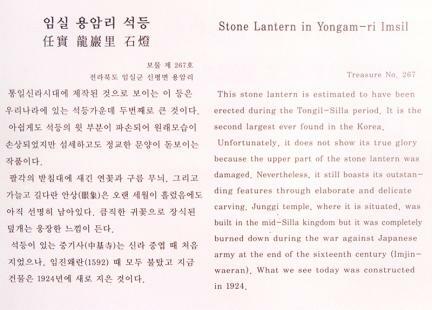 Judging from the fact that the Stone Lantern of Silsangsa Temple (Treasure No. 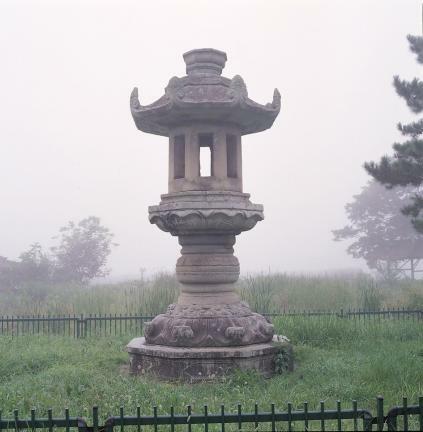 35) and Stone Lantern at Gaeseonsa Temple Site (Treasure No. 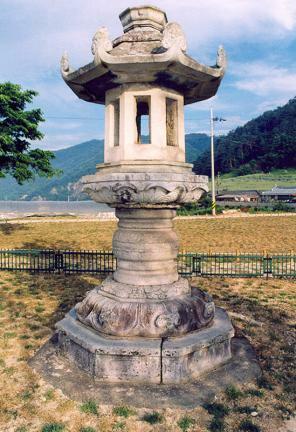 111) all have eight windows, this stone lantern also shows the features of stone lanterns made in Jeolla-do.